Oh! And Santa came today! A bit earlier than expected, probably because we won't be home much the coming days. He brought plenty of fun stuff: books, lots of them, a sewing basket for the girls each and... A sewing machine - not for me, sadly enough, but for the girls. 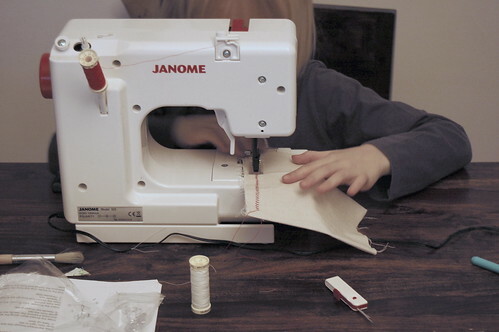 A real one: the Janome Sew Mini. I'll post pictures of it later and pictures of the projects we did today. Both girls made a cherry pit heat therapy pillow and M. sewed a bag - incredibly pretty, and I'm not saying this because I'm the proud mom, but because it simply turned out gorgeously! All I did was cut the fabric, give some instructions and put the pieces together so she could stitch them.